Using the WU-1a optional wireless mobile adapter you can now automatically send great images to your smart phone and even use your smart phone to remotely capture images from your compatible D-SLRs and COOLPIX cameras. With an easy-to-use app, now when you can't wait to share that great shot you don't have to. Share it to your smartphone in a instant. Easy Transfer: Images from the compatible D-SLR or COOLPIX camera can be downloaded to a compatible smart device as they are taken or download existing images from the camera's SD memory card. Note: Images will be downloaded after they are saved to the camera's memory card. Wi-Fi Shooting: Images can be taken remotely using a compatible smart device using the camera's Live View preview on the smart device to frame and compose the subject. Note: Smart device is used to remotely fire the camera, maximum distance is up to 14.9 metres and the smart device can not be used to adjust settings on the camera. Notes: Movies can not be viewed using the Wireless Mobile Adapter utility (app) but can be played back by tapping the movie or playback icon to display a list of movie apps and choosing an app from the list. The WU-1a Wireless Mobile Adapter works with Wi-Fi 11b/g/n. Android™ version 2.3 or later (smartphone), Android version 3.0 or later (tablet). iPhone® and iPad®: iOS version 6.0 or later. 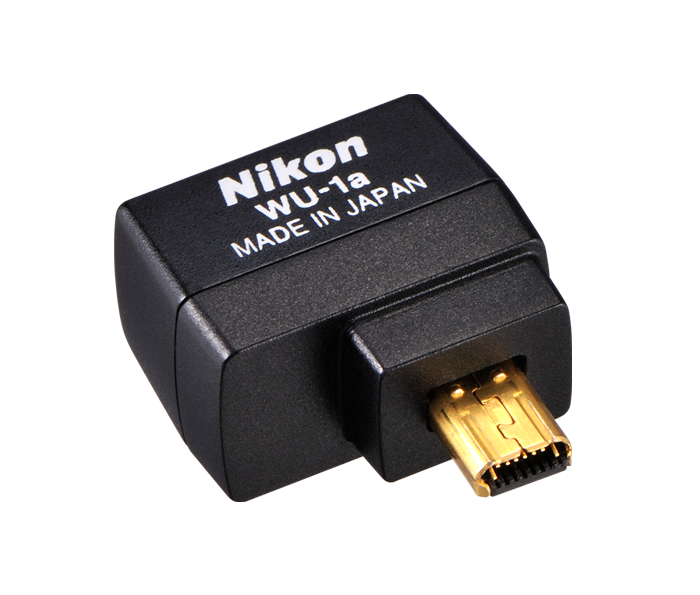 A camera connected to the WU-1a Wireless Mobile Adapter can only be used with a compatible iPhone®, iPad®, and/or iPod touch® or smart devices running on the Android™ operating system. The Wireless Mobile Utility application must be installed on the device before it can be used with a camera connected to the WU-1a Wireless Mobile Adapter.